What do football players do when the NFL's biggest game of the year -- the Super Bowl -- is over and the season officially comes to an end? Some travel, relax and spend much-deserved time with friends and families. Others, it turns out, explore the possibility of starting their own businesses. That's where the NFL's Business Management and Entrepreneurial Program comes in. Started in 2005, the program aims to provide players -- who can often leverage their wealth and connections -- the skills to succeed in business. More than 700 current and former players have participated in the program, held annually during the offseason at some of the best U.S. business schools. Several of those players have gone on to launch startups, including these three success stories. The former players share their journey through the NFL's entrepreneurship program and the business lessons they have learned along the way. For Loveland, Colo., native Jeremy Bloom, sports and business have been a balancing act. He began skiing competitively as a teenager and became a two-time Olympic star and winner of 11 World Cup events and two World Cup titles. Then in 2006, while continuing his skiing career, he was drafted by the Philadelphia Eagles as a wide receiver. Bloom left football in 2008 and retired from professional skiing in 2009, but had long dreamed of owning a business. "I found myself up at 3 a.m. creating business plans rather than studying my playbook," says Bloom, who is 29. In 2007, Bloom participated in the NFL's entrepreneurship program at the University of Pennsylvania's Wharton School. Not long after, he met Hart Cunningham, former CEO of international social network PerfSpot and global advertising network Spot200. By 2010, with about $500,000 of their own money, Bloom and Cunningham started Denver-based Integrate.com, which helps brands and agencies run multichannel ad campaigns. Integrate also received a $4.25 million investment from the Foundry Group, a Boulder, Colo.-based venture capital firm. Integrate has grown to more than 130 employees with offices in Scottsdale, Ariz., San Francisco and New York City. Bloom says the company generated more than $10 million in sales last year. Lesson learned: Find a complementary co-founder. Bloom says his business sense meshes well with Cunningham's technology background. "If both cofounders are strong in business development, for instance, it can be difficult on the product side," Bloom says. "If both founders are tech-focused, it can be difficult to win on sales." Jeb Terry and Ryan Nece met on the football field as teammates on the Tampa Bay Buccaneers. Nece joined the team in 2002 as a linebacker, while Terry started in 2004 playing right guard. Off the field, both had business aspirations and participated in the NFL's entrepreneurship program in 2005 at Stanford University's Graduate School of Business. Nece and Terry left the Buccaneers following the 2007 season and reconnected in 2010. Terry, who is 30, phoned Nece, 32, with an idea for a new business: a mobile platform where football fans can hear unedited audio messages from their favorite players. 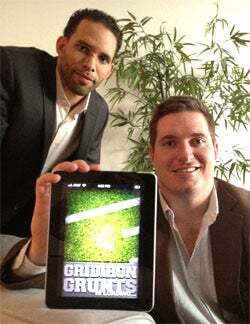 They founded Chapel Hill, N.C.-based Gridiron Ventures LLC, which this spring unveiled the Gridiron Grunts app. It lets fans subscribe to their favorite NFL players' channel on the platform and listen to short audio clips of the players talking about their lives and the game. Users also can submit their own audio responses. Nece and Terry have recruited more than 50 players to participate, among them San Diego Chargers quarterback Philip Rivers and New England Patriots tight end Rob Gronkowski. Users pay either 99 cents per month for each player subscription or $4.99 per month for unlimited access. The number of subscribers has grown "steadily," Terry says, but he declines to disclose the total. Lesson learned: Never be complacent. Surviving in the competitive Apple Store and Android Marketplace can be a constant battle. "If you aren't … improving the customer experience and seeking new opportunities, you can eventually become irrelevant," Terry says. "You never know which opportunity or relationship will be the one that accelerates your business, so it's imperative to explore every one." 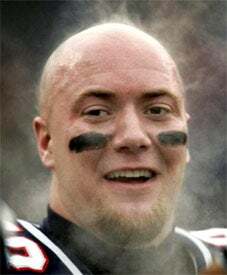 At six feet, four inches and about 250 pounds, former New England Patriots linebacker and Super Bowl champion Matt Chatham isn't bashful about saying he likes crepes. In fact, he's made selling them a business. Chatham attended the NFL's entrepreneurial program at Harvard Business School in 2006, and graduated from Babson College in Wellesley, Mass., with an MBA degree two years after retiring from football in 2008. At Babson, he took top prize at last year's Douglass Foundation Graduate Business Plan Competition for SkyCrepers LLC, a quick-serve crepe franchise model he developed. Chatham put his plan into motion and self-funded the opening of the first SkyCrepes restaurant in August at the Emerald Square Mall in North Attleboro, Mass. While still in the early days, Chatham says sales so far have been "promising." His plan is to open more SkyCrepes locations around New England, then turn the brand into a national franchise. Lesson learned: Know your market and be versatile. Chatham says his biggest startup challenge has been developing a business in an uncertain retail market. "Whether you're online or have a store at an airport or a large regional mall like ours, you have to be versatile because you don't know how consumer spending will come or go," he says. "You can't always know what's coming around the corner, but it's important to take educated risks, instead of throwing something against a wall and hoping it will stick."